Despite our objections to BMW using its M name on anything but its pure sports models, the company's gone and revealed its latest 3-Series cars in M Sport spec anyway. That means no M Power, but an aero kit, sport suspension setup and 18" M star-spoke alloys (or, optionally, 19" double-spokers). Inside you'll find more such puffery (no word on how many Alacantaras were killed). Feel free to browse the spec sheet after the jump. The BMW 3 Series Coup and Convertible ranges both have a new flagship model. The M Sport specification level is now the most dynamic and sporting incarnation currently available for the recently launched Coup and Convertible ranges. Offered on all engine variants, M Sport cars come with a raft of additional equipment as standard compared to an SE model. An M Aerodynamic body styling package gives the cars a distinct, sporting look, while Sport suspension with a stiffer, and 15mm lower, set-up provides a more focussed ride. All models come with 18-inch M star-spoke light alloy wheels as standard with a differently styled 19-inch M Double-spoke light alloy wheel as an option. High-gloss Shadow line exterior finishes to the window surrounds is also a standard feature. Inside, all M Sport models feature Sports seats upholstered in Blue Shadow cloth Alcantara, Individual anthracite headlining, M designation doorsill finishers and a short-shift M gearlever with a perforated leather gaiter and handbrake lever. A Brushed Aluminium interior trim and M leather steering wheel complete the package. M Sport models are traditionally a popular choice for BMW buyers. On six-cylinder-engined 3 Series Coup and Convertible models they account for more than three-quarters of all sales. The introduction of this latest generation of sports model is expected to maintain this ratio. M Sport model cars are only available in a choice of four metallic colours (Titanium Silver, Black Sapphire, Le Mans Blue, Sparkling Graphite) and two non-metallic colours (Alpine White, Crimson Red). Prices start at 28,330 OTR for a 320i M Sport Coup rising to 37,745 OTR for a 335d M Sport Coup . 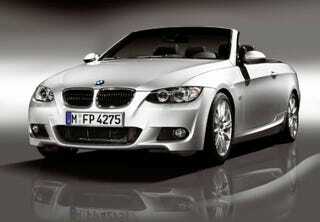 The entry-level 320i M Sport Convertible costs 32,255 OTR while the range-topping 335i M Sport costs 40,250 OTR.